This hectic school year has made graduation and prom confusing for some of us young Montrealers. Does it count if we haven’t been to class since February? Political power plays notwithstanding, it’s always nice to look forward to the end of classes and the look on your parents’ face as you walk up to the podium to receive your diploma. The Flower Pot is with you every step of the way. Check out the corsages, lovely gifts, and stunning wristlets on the dedicated graduation and convocation page. 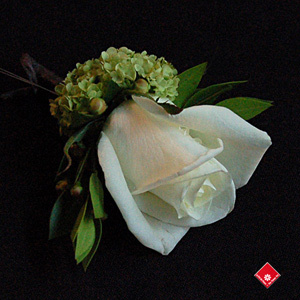 Gentlemen, the rose boutonnière is particularly beautiful with its soft white petals and young flower buds. Ladies will love the mini cymbidium orchid wristlet that comes in pink, white, and green. Parents looking for a meaningful and timeless gift for their young graduate will love the rose-filled Graduation bouquet. Come by and visit your friendly Downtown Montreal florist located in Griffintown to browse through all our gift options. If you're looking for a more personalized gift, visit our website, call us at 514-938-1234, or stop by our Griffintown shop (1340 Notre-Dame Ouest) for more recommendations and to place your order.